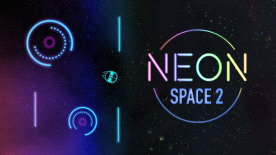 Neon Space 2 is a highly anticipated sequel to Neon Space. The game kept all the elements from his predecessor, but at the same time the visuals received a mayor improvement. Goal of the game remains the same, you still have to guide your ship through numerous checkpoints to finish the level, while dodging obstacles, timing your abilities, solving puzzles to advance through the game, while trying to beat your previous high-score to obtain the gold medal. Enjoy the uplifting music, breath taking visuals, solve puzzles, don't be afraid to fail, the game might be a bit tricky towards the end, but everyone can master it, and become the NEON KING.